Our biggest pleasure in the world is fresh pasta. Nothing is better. We love it fresh and simple, cheesy and baked, spicy, creamy, herby, saucy – I swear we would eat it daily if we could. Ahhh the thought of a spicy crab linguini – just what both of us crave on a hang over.. wins hands down over a fry up. We have both had recent weekend getaways to Italy the land of pasta J – Jemima was whisked away on a romantic weekend to Positano with her husband Ben. And Lucy was taken to Venice for a late birthday treat from her boyfriend. And we did not hold back on the pasta eating, in fact I think we had pasta for most meals, oops. Venice was incredible; we had the best time getting lost wondering around the city, down winding streets, over crumbing bridges. I think quite possibly the most romantic place we have been to, sitting out on a balmy evening in the San Marco square at Café Florian (the oldest café in Venice) listening to a live orchestra sipping amaretto and brandy, just dreamy. However we ate like pigs, I am now having to do extra exercise for my naughtiness, but it was worth it. My favorite pasta dish was from a restaurant that we stumbled across on our first night, small and cozy with a menu that changes daily – they keep it so fresh they don’t even have a freezer! Anyway I had homemade tagliatelli with prosciutto crudo, mortadella and porchetta with garlic and parmesan, oh it was so good. We then had rhubarb and ginger cake and the best panna cotto of my life for dessert – still dreaming about it. Jemima- I have just come back from a long weekend with my husband in positano, it has been a long time plan as the last trip we will take before the baby comes- a babymoon. So we treated ourselves to a full on 3 day food binge- eating pasta for both lunch and dinner (when in Italy). There is nothing better then when the Italians do it simple, using only a few very fresh ingredients and plenty of extra virgin olive oil. Farm to fork isn’t some new fashion there, its been around and remains the way of eating there. The place that we fell in love with is called Lo Scoglio. This restaurant is entirely family-owned and family-managed. One of the sons is the chef. The place and the food served here is simple, seasonal, and perfect. All of the seafood is caught locally by artesenal fishers, and all of the fruit and vegetables are produced in the family's own orchard and vegetable garden. Everything we were served - by a lovely daughter of the family - was completely delicious, especially the zucchini pasta and wild clam pasta. One of our favorite Italian salad dishes is the infamous Caprese – buffalo mozzarella, fresh sweet tomatoes and basil, sometimes with the added ingredient of the avocado. Sadly you will find very poor copies of this dish in London, simply because we don’t have the same quality ingredients that they do in Italy. Here we often find tomatoes fluffy and tasteless but in Italy they are as sweet as strawberries – so if you are making this dish you must make sure you find good quality baby tomatoes, it makes all the difference. 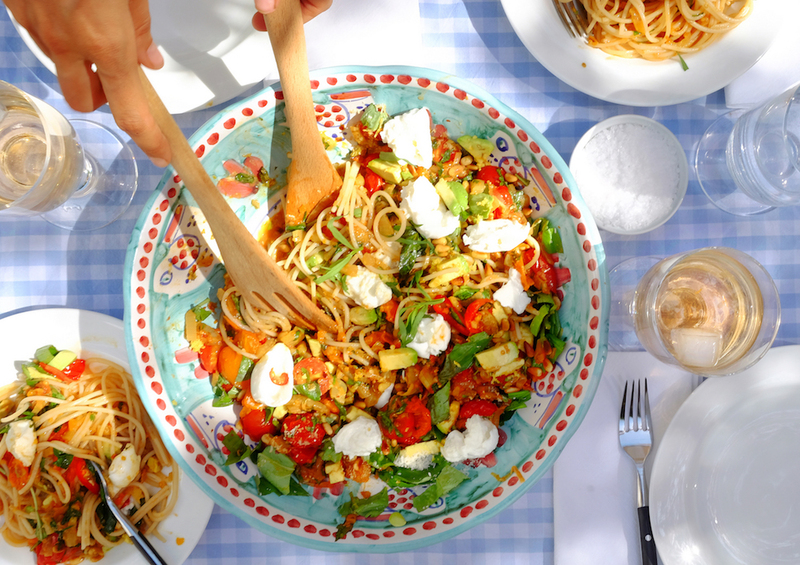 This pasta dish is our take on the caprese – a fresh summery spaghetti, ideal for an al fresco lunch, perfect with ice cold rose. Although this defeats the purpose there are now fantastic gluten-free pastas for those who are staying away from gluten – we love the quinoa, corn and rice pasta that you can order from Ocado. 1. Heat a good drizzle of olive oil in a medium frying pan and add the shallots, fennel, garlic and chili. Cook over a medium heat until caramelized – keep stirring so not to burn the garlic. 2. In the mean time bring a pan of water to the boil and add the pasta – cook to the instructions on the pack. Then refresh drizzle with olive oil and shake then leave to the side. 3. Add the white wine and let reduce for a min or so then add the tomatoes – cook for about 5 mins. 4. Add the pasta to the pan and combine then carefully stir in the mozzarella, avocado, pine nuts, lemon zest, basil and tarragon and season with sea salt and freshly ground black pepper. 5. Divide between bowls and grate parmesan if desired.